Bunting has many uses in the signage and advertising industries. 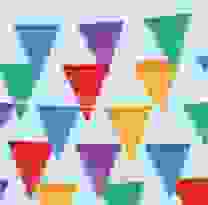 These involve corporate promotions, campaigns, car sales industry, real estate sales, street decorations and shop fronts (SALE SALE SALE) etc. Bunting is perfect for highlighting products close to the point of purchase. It can be used to attract the attention of customers and reinforce key messages. The bunting can be made or cut to any length, to suit any purpose. Bunting can also be used very effectively for creating boundaries at festivals, street parades, carnivals and major sporting events. It also assists in creating an overall vibrant atmosphere. Bunting draws crowds to where they need to be. This bunting from The Aussie Flag Factory features coloured plastic vinyl flags sewn together on a header tape. Bunting is perfect for drawing attention to your sales, promotions or sporting events. Choose your colours; either plain or a combination, and choose your length. Price is $2.45 per metre, for a minimum of 50 metres per length. Please type in your order quantity below. PLEASE CONTACT US WITH YOUR COLOUR REQUIREMENTS. This bunting from The Aussie Flag Factory is Rectangular shape Australian Flag vinyl flags sewn together on a header tape. Bunting is perfect for drawing attention to your sales, promotions or sporting events. Price is per metre, for a minimum order of 50 metres. 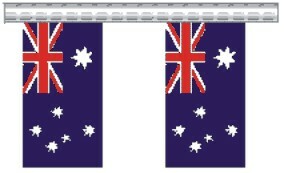 This Black and White check bunting from The Aussie Flag Factory features vinyl flags sewn together on a header tape. 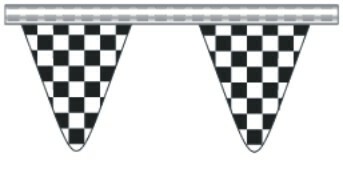 Checkered flag Bunting is perfect for drawing attention to car yards and motoring events. Minimum order of 50 metres. Price is $3.25 per metre, for a minimum of 50 metres. 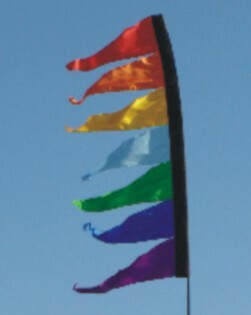 Customised or Branded Bunting Flags is a great promotional tool for your sale, promotion or event. Whether your launching a new product, or wish to promote an existing one, Custom Printed Bunting flags are a great tool to draw attention to your brand. Printed single sided on banner vinyl, your logo will be printed in full colour and sewn on a reinforced tape header. Call or email for a quote on your custom bunting needs, starting with a minimum print run of 30 metres.